She can explain grammar in an easy to understand manner. She is very patient." 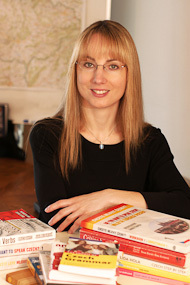 My name is Silvie Opatrná and I am a native Czech speaker. I was born in Prague and lived in the Czech Republic until the age of 18. I have been teaching Czech to private students since 1999 on an individual basis and in small groups of up to eight students. During that time I have been designing lesson plans based on individual student needs and interests and writing handouts to help students with specific grammar points and to give them additional practice. In addition to providing individual instruction, I teach Conversational Czech courses at the University of Washington Experimental College in Seattle and Seattle Central Community College.